Breitling Exospace B55: Breitling puts the smartphone into service to make the functions of its luxury Swiss chronograph accessible–and to add many more. Owners can use their smartphones, via Bluetooth, to make watch adjustments like time setting, time zones, alarms, display, modes and other operating parameters. Measurements from the chronograph, such as flight times and activity sequences (laptimers) can be easily communicated to the smartphone so they can be stored and recorded. The watch includes an electronic tachometer, a countdown/count-up system, Mission Elapsed Time operations and will record flight times while memorizing the takeoff time, landing time and date. In addition, it can receive email and most types of messaging notifications. The 46mm titanium watch has an LCD display with high-intensity backlighting system. It holds a charge for up to two months and is recharged via plug or USB port. 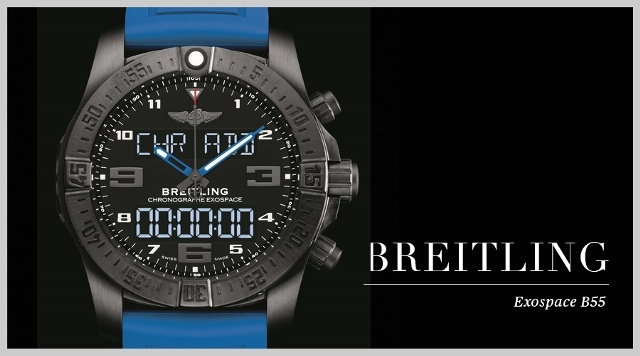 Inside is Breitling Caliber B55, a SuperQuartz movement that is chronometer-certified. Price: $8,900. 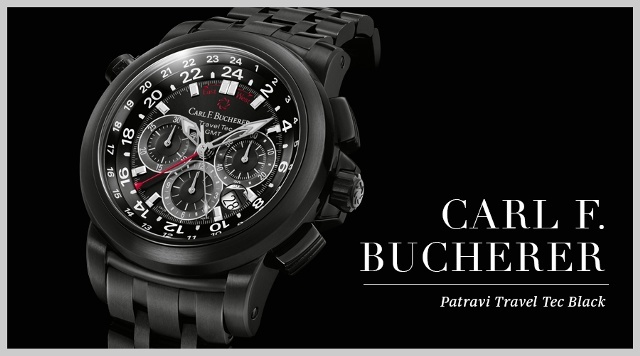 Carl F. Bucherer Patravi Travel Tec Black: Now in an extra-masculine deep matte-black color, the result of a diamond-like-carbon process on steel, this newest version of the Patravi TravelTec displays three time zones simultaneously. Two time zones are visible on the dial directly from the chronometer-certified CFB 1901.1 caliber inside while the third time zone is displayed via a red 24-hour hand on a rotating bezel. The patented monopusher enables the wearer to quickly and easily set the third time zone to an eastern or western direction of travel. The design is rounded off with a black dial offering a clear display of contrasting light-colored totalizers, indices, and scales. Price: $15,700.